Team Flat Tire Co. is a group of cyclists based out of Greensburg, Pa. Our goal is to grow and cultivate the local cycling community. Members of our team are responsible for hosting group rides, events, camps, clinics, and supporting the local PA, WV, and OH race scene. Our annual sponsorship drive provides funding for jerseys, helps with race entry fees, lodging at major events, permitting for races, camps, and furthering education for cycling instruction. Our sponsors see results with us on and off the podium. “We have always loved cycling and are so glad to support the Flat Tire team. These guys and gals have a passion for cycling like nothing else. Providing support needed to run their programs puts a smile on my face. It’s so great to see them introduce the sport of cycling to such young kids. “— John + Melanie Harris, The Stereoshop Inc., 4 year sponsor. “Having an inviting local bike shop to take my children to has been a blessing. As the bike shop has grown so have the amount of community events, races, and camps. We see our logo represented regularly as team members host events, training rides, group rides, and post podium pictures. I really like seeing the tags on social media, it has been well worth the sponsor dollars.” — Dr. Patrick Kelly, Wellness on The Point., 3 year sponsor. “We love having real athletes use our products for results. The feedback we get from them really helps, especially with 1-TDC joint and muscle cream. Working with the members of Team Flat Tire Co. has been a pleasure the last few years. They always provide good content and show our support to the community.”. — Mark Sever, Elite Science., 3 year sponsor. 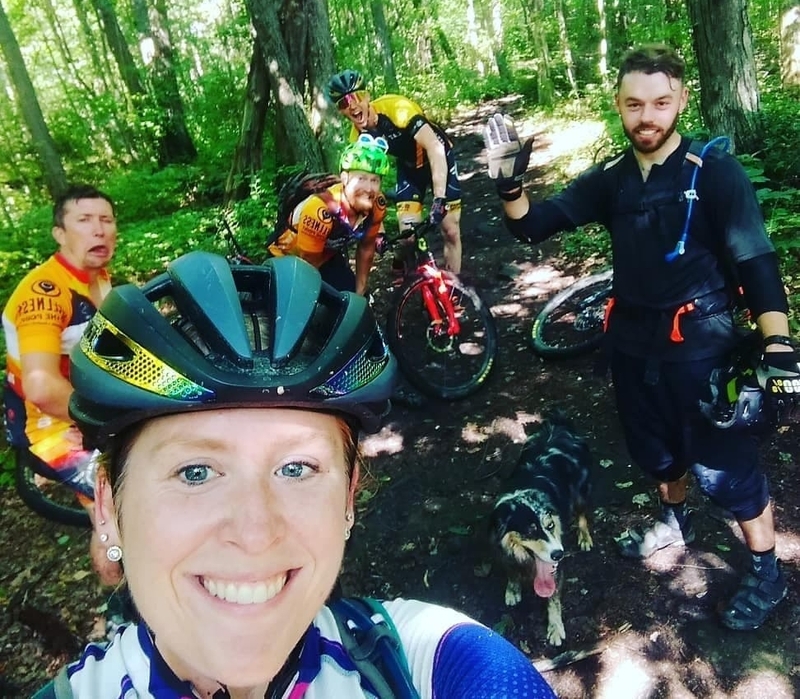 Team Education: Funding will be utilized for scholarships to obtain Level 1 coaching certifications for select team members from the PMBIA (Professional Mountain Bike Instruction Association). By becoming trained and certified instructors we will be able to effectively teach and guide local youth in all aspects of cycling. Our riders have been on bikes for decades, it’s time to give back and share the knowledge. Your support will help cover the travel cost and educational fees. Collegiate cycling sponsorships are becoming more prevalent as the sport grows. Help us cultivate our local youth, they are the future of this program. Bike Instruction: This will be our inaugural year for kids summer camp. Spanning 5 days with one overnight trip. The kids will start with the basics and work up the skills and confidence to shred the gnar by the end of the week. Funding helps us obtain youth demo bikes for instruction, provides funding for kids to attend events, and PMBIA certifications targeted at devolving essential skills. Help us grow the positive impact our program is having on the community. Kids Camp Scholarship Fund: Each platinum sponsorship will provide an entry to our kids camp and a Kona Honzo 24” for the camper. The scholarship will be given out as part of an essay contest. We welcome you to be part of the process and help us choose the lucky candidates. Events: Flat Tire Co. hosts a variety of community oriented events geared towards getting parents and children active, and racing bikes. As part of your support we can include your logo on event ads and promotional items. Your company is welcome to set up a tent or participate in anything we host. Flat Tire Co. draws up to 500 people at each of our races. Contribution amount determines exposure size at events. If you are interested in spearheading funding for a specific event, camp, or clinic talk to us. Team Support: Bikes, helmets, and shoes can cost thousands of dollars per year for members. Sponsorship dollars enable us to provide free or discounted equipment, and bikes to keep our racers and youth riders looking fresh and safe every year. Entry fees, travel funds, and lodging all add up over the course of a year. 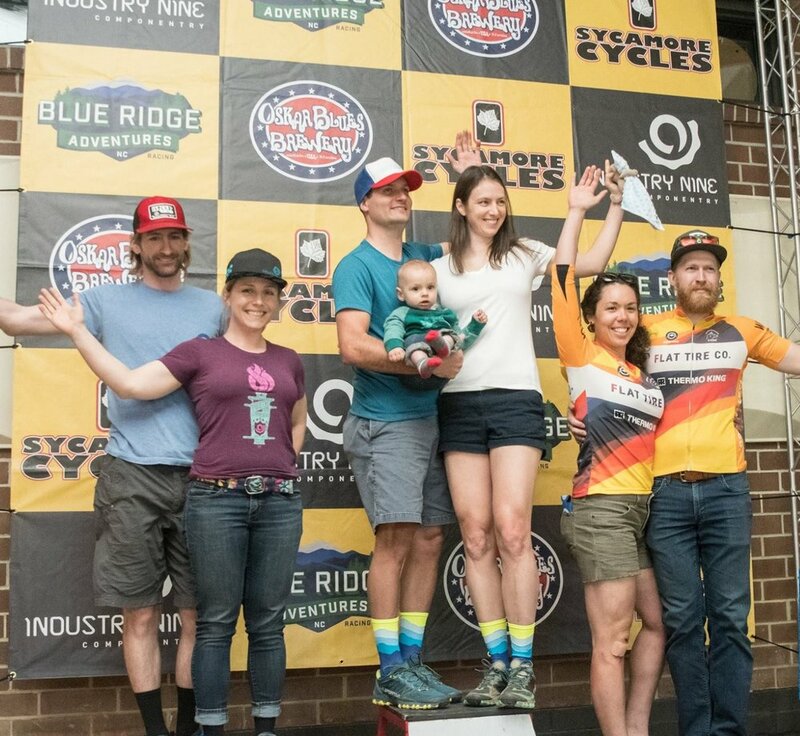 We utilize sponsor dollars to cover entry fees at USA Cycling Nationals and larger Professional level mountain bike racing events across the United States. Van Wrap: Platinum and gold sponsors are eligible for logo exposure on the side or back of our van, contribution size determines logo size. Our van is used for transportation to and from events we host and participate in. Travel is mainly within PA, WV, OH, and the extended East Coast. Our team hosts regular no drop group rides for the community on both mountain and road bikes. We believe no-drop rides focused on having fun are the best way to get more butts on bikes. Logo on the side of our van used for camps, events, and racing. Logo spot front center on the team jersey. Logo on front of all podium and volunteer wear. Logo on team web page. Main logo on all jerseys provided for kids at camp. Weekly social media announcements and tags. Welcome to set up at any event we host as a vendor. Optional free entry to our 2019 Pisgah Bike Trip. 2019 team kit and podium wear with sponsor logos for you. Invitation to annual team party and recap. Talk to us about how we can customize to meet exposure desires. Our members race locally and regionally an a regular basis year round. Logo on the back door of our van used for camps, events, and racing. Logo spots on top of chest or arms. Logo on all podium and volunteer wear at events. Our 2019 Podium wear with sponsor logos for you. Our team riders are the folks the bike shop count on to help host events and camps for the community. Your support helps us get out do do something we love while giving back. We are on the podium at almost every race we attend representing the brands that support us. Our members race cross country and enduro mountain bikes, off-road triathlon, and cyclocross. Logo center back of jersey. Welcome to set up as a vendor at any event we host. Basic Donner: $250, in kind donation for camps, or volunteer time accepted. Logo on back pocket of jersey. Logo on team podium wear.